For this project,we used recycled hardbound books instead of canvas. I started collecting discarded books from my library in the fall, and had enough for all students by March. Because I wanted the students to have the choice of standing or hanging the finished books on a wall, we started by drilling 2 holes in the back cover and using wire for a hook. Then a single hole needed to be drilled through the entire book to secure the cover and pages with string, so it wouldn't flop open while hanging on a wall. Since the books had various covers, we first painted the covers white. Note, the older red books bled into the white paint, so their primed background was pink. The kids got very worried, but found out later that acrylic will cover colors underneath, and they painted over the pink the next day with their subject or design. After painting the books, students chose 3 colors of embroidery thread and used a needle to put the thread through the holes, one color at a time. Then threads were tied and the book was done. My students' Mona Lisa mural (more info. 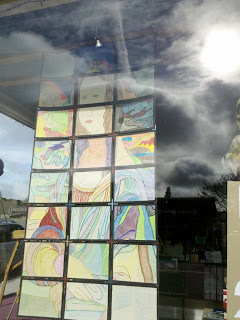 about creating her here)is up and in the window of our super awesome local art store called The Artery, in Atascadero, CA. I love the atmosphere and ambiance of locally owned shops like this one so much more than big-box-corporate stores with names that start with "M" and end with "s"......don't you? This is the kind of project that would've been somewhat time consuming to do on my own. Luckily, the owner of the store was my partner in mounting and hanging the mural. Step one: Glue each 9x12" colored paper to 11x14" black mat board. Big thanks to The Artery & NCCS high school art students! This was super fun lesson I found on the School Arts Magazine website, and the lesson is credited to: Explorations in Art, Davis Publications, Grade 2. I used it with grades 4, 5, 6 and the kids enjoyed it a lot. Step 1: Fold each rectangle, lengthwise, into a 90 degree angle. Step 2: *Glue 4 rectangles to form the bottom, then glue 4 rectangles to form the lid. Step 3: Glue 4 pillars to inside corners of the bottom. Step 4: Add glue to inside of lid. Step 5: Place lid on outside tops of pillars. *Tip- tell students to hold pieces together with their fingers for the count of "5" each time they glue a piece to another piece. Thanks to San Benito Elementary students! In like a lion, out like a lamb. Big thanks to Teach Kids Art for this lesson idea. The kinders and 1st graders loved the magic of painting on top of white crayon resist and being able to see their darling lambs AFTER the paint is added. Because I was doing this lesson with a public school, I decided to use a spring poem instead of the religious quote used originally. Here's the poem I shared with the kids before our project. Like a lamb so dear. Second, we drew a curvy black "ground" lines, black legs, white fluffy-cloud bodies, black oval heads, and black tails. Third, we outlined suns with black crayon, and added some grass. Fourth, we painted the ground green, then the sky blue. This student is blind, and his grandma is helping him with this project. Who doesn't love an Oreo cookie?! Feel free to use my pics and please link back, but please don't copy my text without my permission. Thank-you. "Make each day a masterpiece. ", Joshua Wooden, John Wooden's father. My Website with more Lessons on DVD. Perfect for Substitutes! 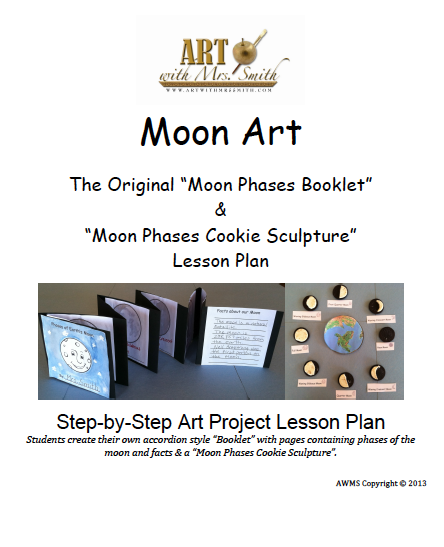 I've been teaching art since 2004 to kids in grades k-12 at numerous schools. This makes me grateful! Not a day goes by where my brain doesn't think, "Hmmmmmm - I wonder how I could turn 'that' into an art lesson?" My wish is for all children have art opportunities & for adults to embrace their creative abilities! PDF POSTERS YOUR STUDENTS CREATE! 2 Sizes: Poster & MEGA Poster! 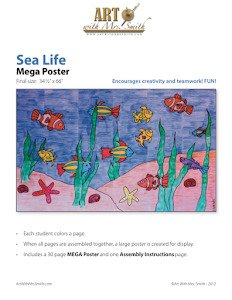 Sea Life Mega Poster Student Samples here. See student Pop Art examples here. See Planet Booklet student samples here. View "Great Wave" student examples here. View "Egyptian Art Book" student examples here. View Navajo Wedding Basket student examples here. A super link here , The Art Room Explore Page, for kids wanting to get artsy on the computer! Really Great Art Books, really!